The all new CCP (Concealed Carry Pistol) in 9mm Luger has an ideal combination of style, ergonomics, size, shape, accuracy, and ability to conceal comfortably. 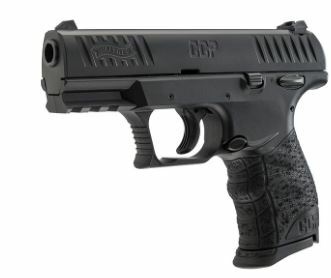 The new Walther SOFTCOIL™ gas-delayed blowback technology works to make the CCP an excellent concealed carry firearm.
" Love this gun. Shoots great, carries even better. I could not be any happier. " " Really feels good in the hand, fast target picture, lower recoil and no failures in over 400 rounds. Happy I have one. " " Shoots great ... does not like federal aluminum rounds. Likes everything else I feed it "
" I purchased the ccp with every intent on only using for concealed carry. I have shot 50+ rounds thru this gun at a very fast pace I have ordered extra mags and have had NO heating problem thru the frame and the right on accuracy is no issue. I would give this gun a very high rating. I shoot very hot loads and love it. Thinking about buying the all black model next "
" Hot, and that is not a good thing. Im sure that most of you like myself enjoys shooting. I purchased this one for the purposes of concealed carry but I still want to shoot it at the range. If I cant train with it, what good does it really do me right Well there in lays one of two main problems with the CCP. First the gas blow back system causes the frame to heat up. It consists of a piston on the slide that sits in the receiver and a port in the barrel that softens the recoil and it works very well at doing that. But the gun heats up to where if you shoot stacking your thumbs on the receiver then it becomes un-shootable after a box of ammo 50 rounds. If you are not shooting in training and only carrying it for self defense then this wont be an issue. But also shame on you for not training with your equipment. The time to learn how to use your firearm isnt when $h!t has hit the fan. You will not rise to the occasion, you will fall to whatever level of training you posses...but I digress. The second issue is trying to take the thing apart and put it back together. Be warned, there are parts here that will fly across the room and you dont want to lose them. Also wear safety glasses so not to put out an eye. It does not dissemble like a Glock, Sig, M&P, PPK or even a 1911. It is just not user friendly in that manner and thus difficult to maintain properly. It does fit my hand perfectly, and is great for point and shoot. Walther is spot on with the ergonomics. The sight dots are small and not easy to see but this can be overcome by just watching the front sight at close distance for quick target acquisition. After all was said and done I switched back a M&P Shield for concealed carry and traded the CCP for a Ruger Mark III. "